When Halloween is over each year, Ronnie York gets out his Christmas lights and holiday displays. His goal is to have as much up as possible by Thanksgiving so he can have his “grand lighting” on Thanksgiving Day. 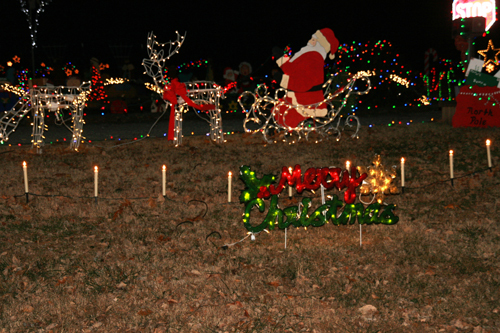 The display of lights, Santa, reindeer, elves, trees, arches, angels, Christmas figures, candles, snowmen and nativity fill their yard. They’ve created most of the wooden displays themselves. A computer program turns the lights on and off each night and plays Christmas music from a local radio station. Ronnie and Kathy York live at 122 Red Bird Rd. To get there, take Tenn. Highway 19 from Ripley towards Brownsville. After you pass Durhamville Road and Elam Baptist Church on the right, you will reach Red Bird Road on your right. When you drive by Chris and Melissa Hoffman’s house this Christmas season, make sure you roll down the car windows so you can hear the music as you look at their decorated house and yard. 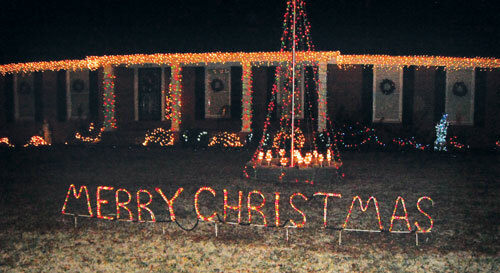 “We love Christmas; we love all of the lights,” Melissa said. That’s why their home at 259 Church St. in Ripley is opulently decorated for the holiday season. “We light up everything in the yard,” Melissa said. “And every year, we try to add something more.” They’re slowly filling up two acres of yard. Their oldest decoration, which was bought more than 20 years ago in Gatlinburg after they married, is a wire frame with Merry Christmas spelled out. It is covered in lights so you can’t mistake its message. The Hoffmans usually start putting up their Christmas decorations on Thanksgiving Day. Chris does most of the work outside, while Melissa is in charge inside. They have a Christmas tree in every room; each with its own theme. The main tree inside is filled with ornaments with special meaning, Melissa said. “Every ornament has a story, where or why we bought it or who gave it to us.” The tree has ornaments made by their two children, Chrissy and Neally, as they grew up and Hallmark ornaments her parents bought. Each year, Melissa said, her parents bought a Hallmark Christmas bell with the year on the ornament. The Hoffmans have six grandchildren. “My oldest grandchild, Carlee, thinks it’s a winter wonderland outside,” Melissa said. Their elderly neighbor across the street says the display brings back many memories for her. Their next door neighbor is decorating her yard, too.